In just a few years, the technology driving wearable devices has advanced rapidly. Samsung launched the world’s very first watch phone in 1999. The SPH-WP10 featured a monochrome LCD screen and 90 minutes of talk time through an integrated speaker and microphone. Samsung followed this in 2009 with the release of its S9110 watch phone which was the world’s slimmest watch phone at the time. While the first model looked like a miniature phone attached to a wristband, the second looked much more like modern wearables. Since then, technology has progressed quickly, and the ability of wearables to transform health, entertainment and how we live our day-to-day lives is greater than once thought possible. In 2013, Samsung launched the Galaxy Gear, which was followed by the Gear 2, the Gear 2 Neo. The Gear Fit and the Gear S made their appearances in 2014. As we wait to see what is in store for wearable devices of the future, it is clear that they are making an impact on how we stay connected. Wearables are a great way to streamline processes, allowing employees to customize client interactions and deliver a more personalized experience. 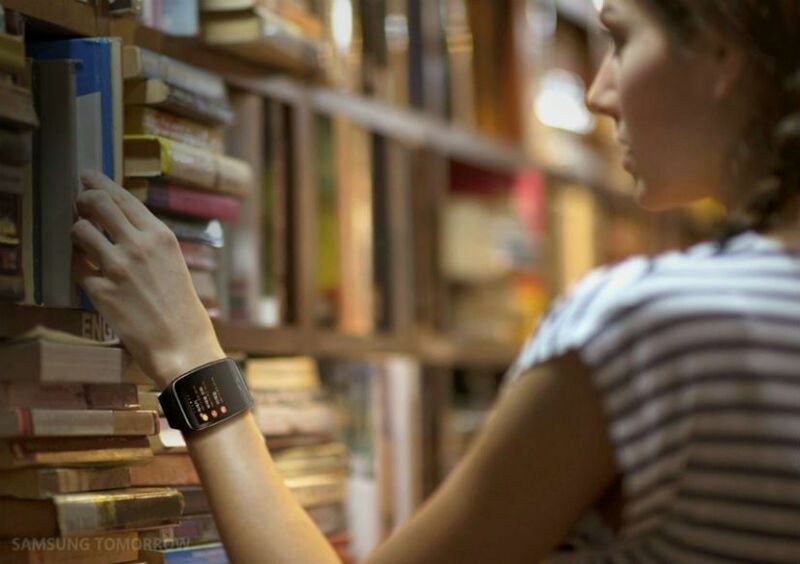 Wearables can collect information hands-free, bringing the smartphone experience to the wrist, which helps create safer working environments and boosts productivity. The Gear S, with its 2-inch Super AMOLED display, allows users to view notifications and messages at a single glance. You can reject calls during a meeting, reply to messages using the on-screen keyboard or use voice command controls when your hands are full. With the ability to connect hands-free to e-mail, calendars, productivity applications and real-time notifications, wearables are changing the way we work. Health and fitness tracking are major areas of concern for consumers. The Gear Fit was designed to be light and easy to wear during a workout, or for simply tracking your steps every day. 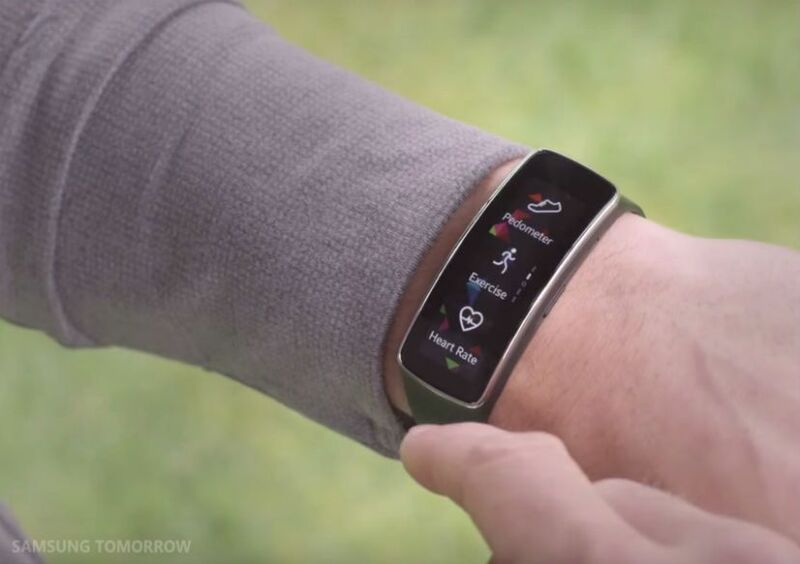 It is the first wearable that was curved to fit your wrist, and featured a slimmer face than the Gear S.
S Health comes equipped and ready to use on the latest Samsung wearables, including the Gear Fit, the Gear S, the Gear 2 and the Gear 2 Neo. You can set goals and track heartrate, steps, calorie intake, stress levels, sun exposure and more. S Health helps you take control of your health. The wide range of apps available for Samsung wearables allow users to build healthy lifestyles that are just right for them. Samsung Gear S not only includes S Health, it is a perfect health and fitness companion with more enhanced multi-sensors and built-in GPS. Using Bluetooth technology, it receives notifications while on-the-go. Partnerships that make third party apps available, such as Nike+ Running and Trek Bicycle allow users to track exercise and stay motivated, without their smartphones. 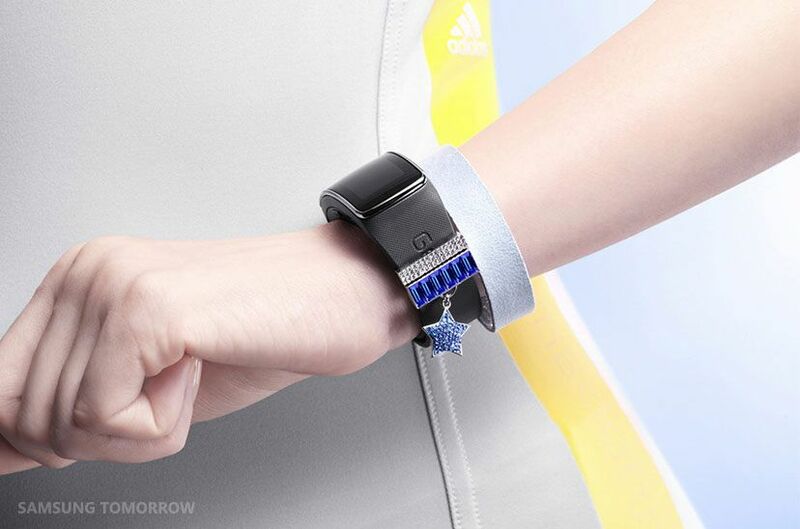 Wearables are also changing the way we stay connected. The Gear S can be used as a stand-alone device, with its brilliant, curved Super AMOLED display. 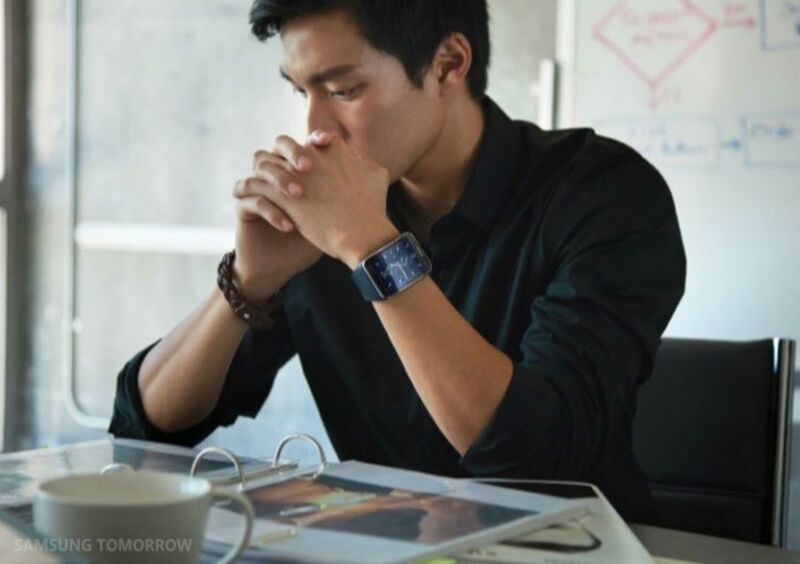 The first wearable that supported connectivity through Wi-Fi, 3G and Bluetooth, the Gear S lets you stay in touch, even away from your phone. The Gear S makes and receives calls, directly from the wrist and syncs automatically with your smartphone. When the Gear Circle is paired with a smartphone, users can easily receive calls, listen to music and make voice commands in style through a Bluetooth connection. 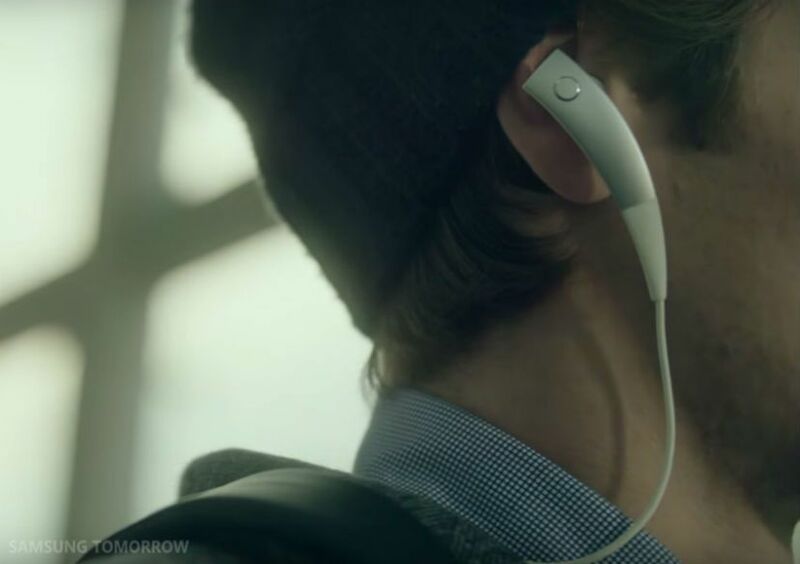 It features a magnetic lock which clasps around the user’s neck when not in use, as well as a vibrate function to signal incoming calls and notifications. The Samsung wearable products feature a rectangular face and interchangeable wristbands. After the first Galaxy Gear, the following Gear 2 had a finishing that made it look more similar to the elegance of a timepiece. With a Super AMOLED, 2MP camera, tracking apps and connectivity power, the Gear 2 took wearable devices to the next level. The Gear 2 was one of the first wearable devices that not only worked in sync to receive notifications from your smart device, it was the first to run apps on its own. When launching the Gear Fit and the Gear S, Samsung applied its curved display technology for a more comfortable, contoured fit. As materials and display quality improved, curved screens were developed and more interchangeable wristbands were offered, wearables from Samsung have become as fashionable as they are functional. Customizable screen options and changeable straps empower users to express their own tastes and styles. The Gear series help users express moods and fit each day’s look with changeable bands and charms. Partnering with leaders in the fashion industry like Moschino, Swarovski and Nicholas Kirkwood, Samsung introduced a collection of wide-range accessories. As the technology and innovation of wearables meets the Internet of Things (IoT), the future of connectivity is bright. It is clear that wearables and connected devices will continue to transform our lives. Wearables will improve wireless connectivity, improving our homes, our cities and communities everywhere.